Christine Little was a person that I was really looking forward to interviewing, having been at the 75th Jubilee of TTNZ in 2009 where she was inducted into the Hall of Fame I was driven to get a perspective on two very different eras of table tennis in Oceania from a player who had swiped up numerous titles in both of them. with 2 Oceania Championship Womens Titles, 3 NZ Open Titles and numerous Veteran event titles which she details in her career highlights. Chris is a very energetic and friendly table tennis player and it was a pleasure to read her responses to my questions. Hope you enjoy too! Chris Little sporting a silver medal at the Australian Veteran Championships 2009 with 050 Mixed partner Craig Campbell. I started playing TT at home around age 9 or 10 (with 5 siblings, sport was a great outlet and hobby) - first on the kitchen table then on a proper TT table – then at school and interschool competitions - then club TT - then state representative – then National rep.
Eugene Herman was a teacher at my high school in Adelaide and played with the students after school on certain days – this developed a TT culture our school which produced some fine players. He was a left-handed hard bat chopper who was extremely consistent and had the wicked ability to smash the loose ball. Everyone started with various points on the board before he would invariably catch up and win. A great way to challenge the players and a hard player to beat. I moved to Melbourne for a year when I was 17 in order to practise and compete with the best players in Australia. My feeling was that you had to play against the better players in order to improve and hopefully, learn to win. Hard question – no ONE person, but collectively, all the amazing TT players (and a few coaches) competing simultaneously throughout my TT career. In particular: Neil Ward - great friend and practice partner, Murray Thompson - coach, Bill Oatey -first coach, Steve Knapp - awesome mixed doubles partner and cohort, Eric Rosario - introduced me to weight training in Melbourne, Malcolm Temperley - friend who had a tremendous love for the game, and my sister, Jenny - who used to halt the stop watch during footwork practice, whenever I collected the ball. Past tense: playing my first Commonwealth and World Champs at age 17 and winning the Australian Open Singles the same year at 18. Winning 2 consecutive Oceania Singles titles in 1978 and 1982, the second one as a Kiwi. The 1985 NZ Open Singles title against Jan Morris – I lost the first game but after that won comfortably. Jan as a very successful and popular player in NZ but I had an 18-3 (or something close to this) win loss record against her and loved playing her. The 1986 NZ Open Singles title against Ann Gyongyos which I won extremely comfortably and was playing some of my best table tennis ever. Induction to the NZ TT Hall of Fame in 2009. 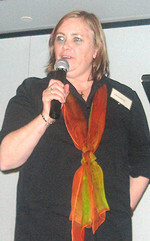 Chris' induction into the TTNZ Hall of Fame at TTNZ's 75th Jubilee Celebration, Whangarei, 2009. Playing well enough to beat Annie Ramberg in the 050 singles final in Sydney in 2009 at the Aussie Vets. She won the European 050 singles a couple of years earlier. Winning 4 consecutive Over 50 singles titles at the NZ Vets from 2007-2010. Winning 3 consecutive 0ver 50 singles titles at the Aussie Vets from 2007-2009. 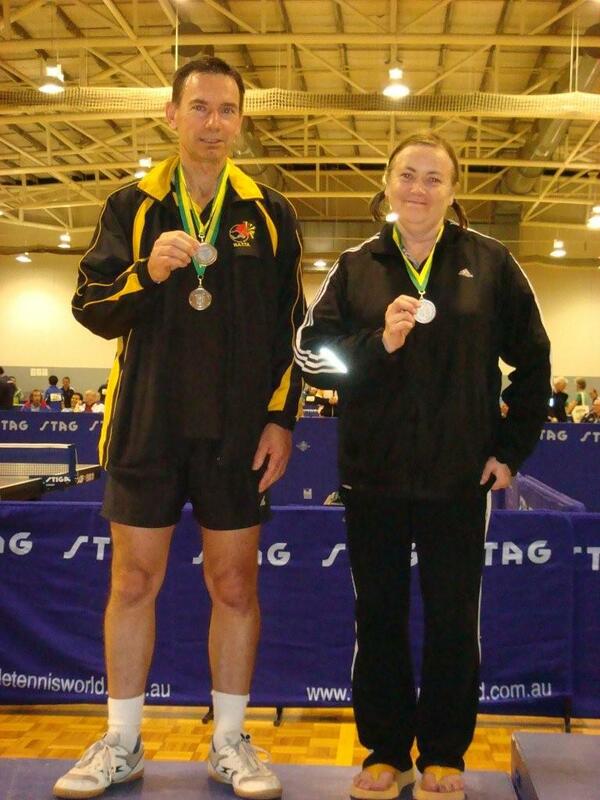 Beating Mr Han and Tutty Tanfana in the NZ Vets 040 mixed doubles final in 2010 with partner Craig Campbell. Any win over Mr Han has got to be a TT career highlight. Winning the 040 Aussie Vets doubles in 2010 with Sarah Sandley – we had won the NZ Open doubles back in 1987. Playing for NZ as a veteran with some wonderful people as team mates – it’s been like a whole new TT career. How do you feel the game has changed playing now from when you were younger? More specifically what is it do you think that allowed a higher standard of players in New Zealand in your era as a Senior Representative than those in our teams now? It’s always tricky to compare TT of different eras – too many variables. Although, less female players now is a big factor and maybe there are more distractions in life these days. Less players means that people don’t have to climb up the ladder over time to (a) achieve results and (b) make teams. Thus, they’re representing their association or country, perhaps, much sooner than in the past. I also think TT practice was something we all loved and we continuously challenged ourselves to improve. We were all very self-motivated. Winter interclub in Auckland was great fun in the 80’s and travelling to the Nationals and the North Island champs was something we all looked forward to immensely. There was nowhere else we wanted to be and there was a great sense of fun involved, playing competitive TT. Who has been your biggest rival out on the table since your career began? Leanne Morrow in the early 70’s - but calling Li Chun Li a ‘rival’ in the late 80’s and early 90’s would be stretching the truth. I have beaten her only ever in doubles and mixed doubles and only on a very few occasions. What do you feel is lacking in the sport as a female player? Basically, not enough girls/women playing TT. For example, I played in an all-women’s TT interclub competition in Adelaide in the early 70’s – the depth of players was fantastic with a huge range of styles, including some excellent defenders. Also the fact that many players only enter their own age group at competitive level and are often playing the same few opponents, but at different venues. Past tense: Liang Ko Liang – 1975 Calcutta Worlds - a Chinese superstar who could both defend and attack astoundingly well. Present tense: William Henzell – such controlled TT economy, for maximum effect. Andre Agassi – I’m a huge tennis fan. Lance Armstrong – He da man! Monica Seles – Before the knife in the back. Ouch. Sushi, falafel wraps, any kind of pasta. Primary school teacher, wife to Ray and mum to Jenny (14), film enthusiast, reading, tennis, music, hanging out with my family, Sudoku, Dutch Blitz, charades. Exploring a new city – love to go to Barcelona, Rome, Dublin or San Francisco. Pay off some debts, then book a holiday. Past tense: Steve Knapp (3 times Aussie champ) trained smart and trained very, very hard. Barry Griffiths trained smart as well. But training’s not the same as a veteran player. Jan Morris (5 times NZ champ) was a fun and a funny team partner and doubles player. I loved having her as my team mate at the 1983 Commonwealth Champs and the Tokyo Worlds. Our team did great and we combined extremely well in the doubles matches and thoroughly enjoyed the experience. She’s definitely one of my favourite team mates. Left to Right: Colleen Aitchison, Jan Morris, Yvonne Fogarty, Christine Little at 75th Jubilee,2009. Malcolm Darroch was called the ‘Mosquito’ due to his persistent buzzing around the table, always coming after you, jumping around so energetically – like those pesky, annoying little mosquitoes on a summer’s night. Malcolm played again at this year’s NZ Vets in Invercargill and won both the 040 and 050 singles so I guess he’s still got it. Be mentally flexible during matches - learn about other players by watching their games - be aware of your own TT strengths and limitations and develop your game accordingly - ALWAYS treat the game and everybody involved in it, with nothing but the utmost care and respect. Thanks Chris, we hope to see your recovery and speedy return back out onto the tables soon!